I’ve been waiting for quite some time to share this recipe with you. 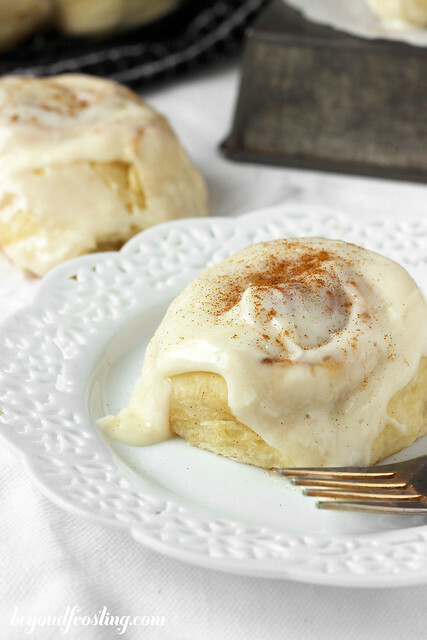 I couldn’t just share these overnight cinnamon rolls at just any old time. I saved them for a special occasion. These rolls make an appearance in our house for occasion like Christmas, birthdays and Valentine’s day. This weekend we have both a birthday and Valentine’s day. 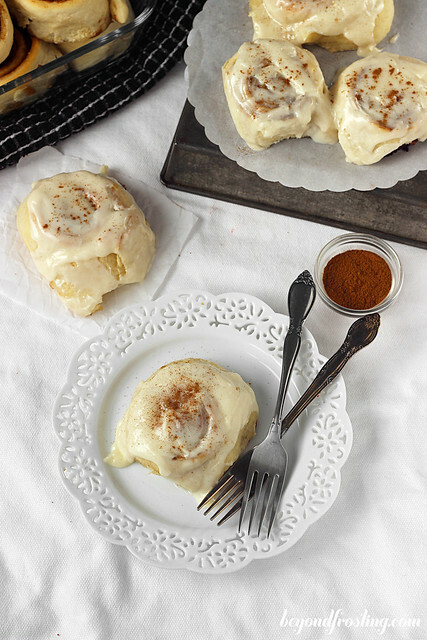 This is not just any ordinary Cinnamon Roll recipe. 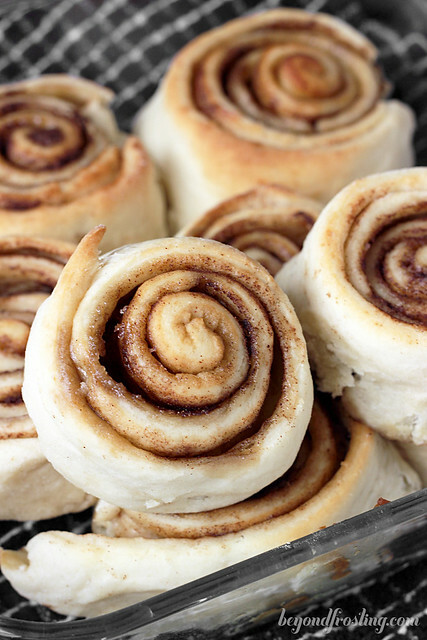 These are Mamagirl Overnight Cinnamon Rolls. I am at least the fourth generation to be baking these cinnamon rolls. Mamagirl, my great grandmother was from the south, Alabama to be specific. She passed this recipe to my grandmother, Edwina who taught my mom, who taught me. If it has lasted this long, you know it much be good! Every major holiday my mom makes Mamagirl Rolls, which are served with dinner. So we started doubling the recipe and using the leftover dough to make cinnamon rolls the next morning. My boyfriend LOVES cinnamon rolls, specifically Cinnabon. So during our first Christmas together, I wanted to share my family tradition with him- Mamagirl Rolls on Christmas morning. I’ve made them every Christmas since we started dating, and a few Valentine’s days too. When I made this batch of rolls, I specifically searched for a copy-cat recipe for Cinnabon icing. Their recipe is a cream cheese icing with a touch of lemon. The recipe I used was from The Slow Roasted Italian. We loved it! 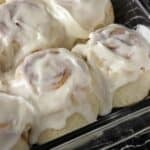 I frosted these cinnamon rolls as soon as they came out of the oven so that the frosting has time to melt over the hot rolls. Now don’t be intimated by the time and steps involved in these rolls. I always prepare them the night before because they take about 6 hours in total and I am too impatient to wait. Let’s walk through a few key points. These rolls need to rise for a total of 4 hours before the dough is refridgerated. The first rise is an hour and the second rise is 3 hours. The third rise is right before baking- which is an hour. If you live in a cold temperature, I suggest to turn on the oven until it reaches 100°F and then turn it off. When you place the dough in the oven, leave the door open for the first several minutes. This provides a warm place for the yeast to expand. I provided suggested temperatures in the recipe. I have found that it is most successful when I use a candy thermometer to ensure that I don’t kill the yeast. If your milk mixture or water is to hot, it the yeast will not expand. After the second rise, the dough should be refrigerated overnight. Mamagirl’s original recipe only called for the dough to be refrigerated. We determined this was because it would be easier to roll out the dough if it was cold. The recipe I provided is a HALF batch, which is enough for 4-6 people. I usually double the batch. You can save the dough and make two batches. I think Mamagirl would be so proud of my for carrying on her tradition. It is just so satisfying to see these beautiful rolls come out of the oven and be slathered with icing. They don’t last long! 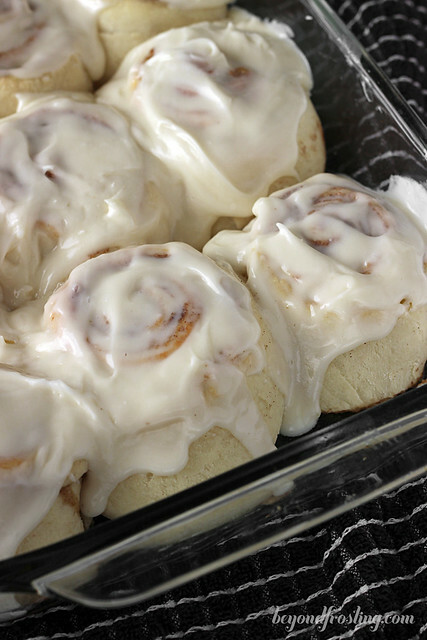 Top with your favorite icing recipe. I use this one. Heat 1 cup milk over medium heat until boiling. Remove from heat and stir in shortening and sugar. Stir until completely melted. Remove from oven and allow to cool until mixture reaches about 110°F. Microwave water for 15 seconds. Water should be lukewarm, about 100-110°F. Dissolve sugar and yeast in water and allow yeast to activate until bubbly and frothy, about 10-15 minutes. Once the milk mixture has cooled, pour in activated yeast and stir. Add 1 ½ C sifted flour and stir vigorously until well mixed. Cover with a wet towel and place in a warm place for one hour to rise. /2 tsp baking powder, 1/2 tsp salt. Stir and knead the mixture until it is soft and pliable. Cover again with a wet towel and put in a warm place for at least three hours. Remove dough from refrigerator and turn onto a gently floured surface. Roll dough out until 1/4-1/2” thick. Melt butter and brush over dough. Roll dough into a log. Cut roll 1-1.5” thick. Place in a greased 9”x13” baking pan. Cover with paper towels and let rise for 1 hour before baking. Bake at 425°F for about 10-12 minutes. 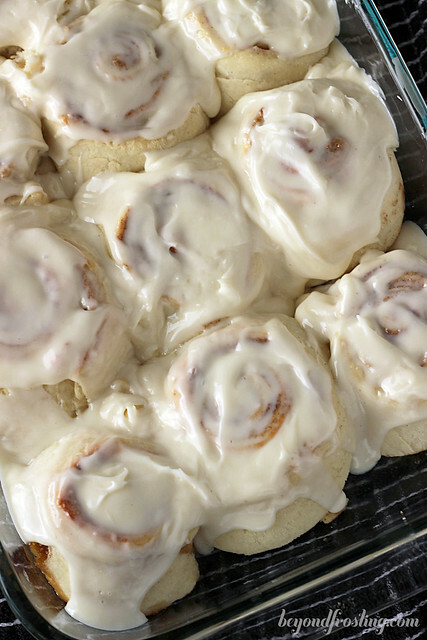 You can cut out and freeze rolls in a pan for up to a week. 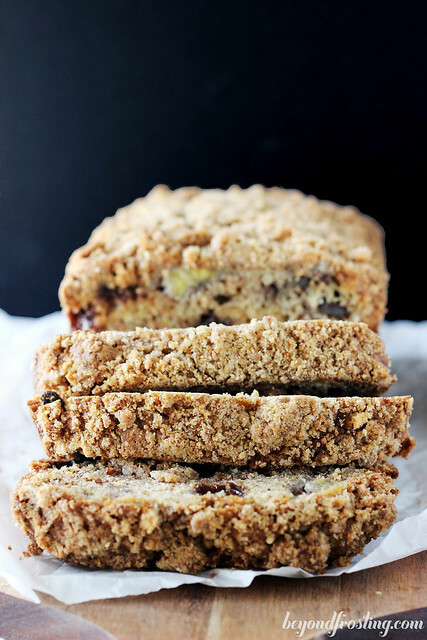 This recipe is for a half batch which is perfect for 2-4 people. If you live in a cold temperature, I suggest to turn on the oven until it reaches 100°F and then turn off the oven. When you place the dough in the oven, leave the door open for the first several minutes. I provided suggested temperatures in the recipe. I have found that it is most successful when I use a candy thermometer to ensure that I don’t kill the yeast. Hi! I *love* your blog and have made many of your recipes, all with great results! 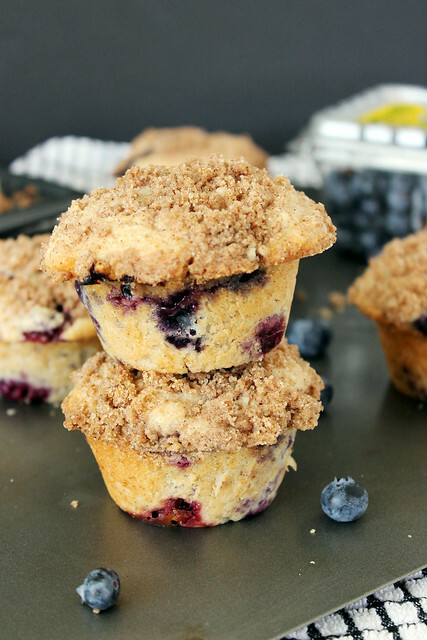 I really, really want to make these for my Husband! I did notice that the link you posted for the icing, no longer works. I know it’s been a while since you originally posted this recipe, but wondered if you still have the recipe information for the icing?! I would love to make them exactly as you do! Hi Amanda. Thank you SO much for your feedback. I am very thankful that you keep coming back! It looks like the link might have been broken but it is email active! I hope you enjoy! Hello. When we get it out of the refrigerator, do we need to let it sit for a while or we can just start working with it straight away? Hi Hala! Yes, you can start working with the dough right when you take it out of the fridge. If you find the dough is retracting a lot, let it rest for five or so minutes before working again. Thank you and have a wonderful day! These look amazing!!!! I am in the process of making them now!!!!! 🙂 Could you tell me how many cinnamon rolls you cut it into, or about how big of a rectangle you roll out? Hi Brienne- Sorry for the delay! I cut them about 1.5″ thick because I like a big cinnamon roll. For the rectangle, I roll it out until it is about 1/4″ thick. I do not want it to be too thin. 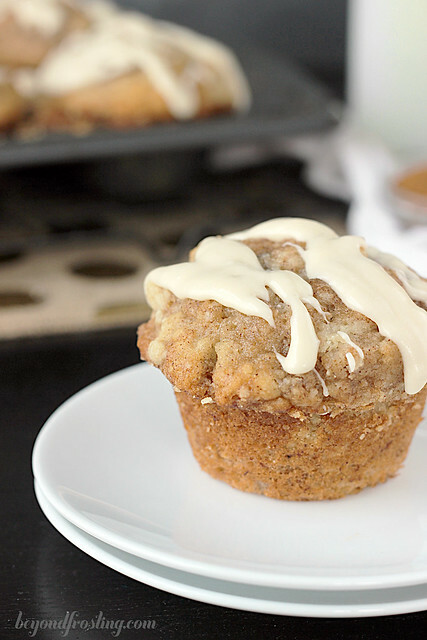 I usually am too tempted to just pull out the tube of cinnamon rolls from the fridge but I may have to try these instead! I’m all about fresh foods! You for certain have made your mamagirl proud! 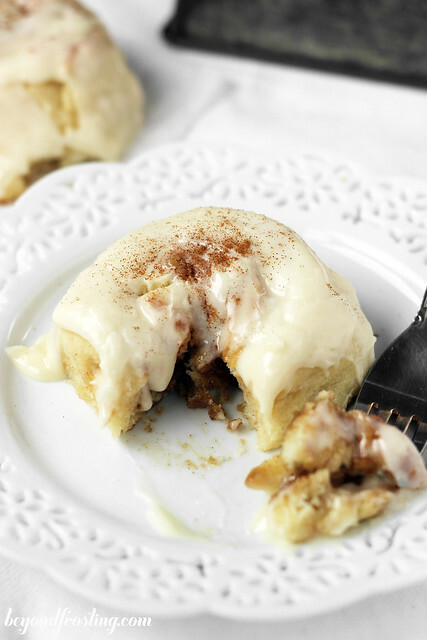 I am seriously falling love with these cinnamon rolls!